Our casa rural in Las Herrerias was a pretty stone place overlooking the pasture complete with cows. It was a bit noisy as there was also a cycling group from Italy staying. was in our back packs, we started climbing the O Cebreiro, described as “daunting” in the guide book. The ascent, situated between the Los Ancares and La Sierra do Courel mountain ranges is 600m (2000ft) over 9 km. The trail was rocky and fairly steep with lots of horse manure left by those who chose to ride to the top. However, whenever we had the chance to look back over the valley, the view was worth the effort. These are very old mountains, their roundness and foliage giving them a soft, embracing quality compared to the ruggedness of our west coat mountains. still very nice. Legends abound about O Cebreiro: there is a memorial marker citing the story of a German pilgrim who got lost in the mist and fog on the mountain. In the distance he could hear music and followed the sound to where a shepherd was playing a “gaita”, sort of a Galician bagpipe. We are now in Galicia in the province of Lugo. 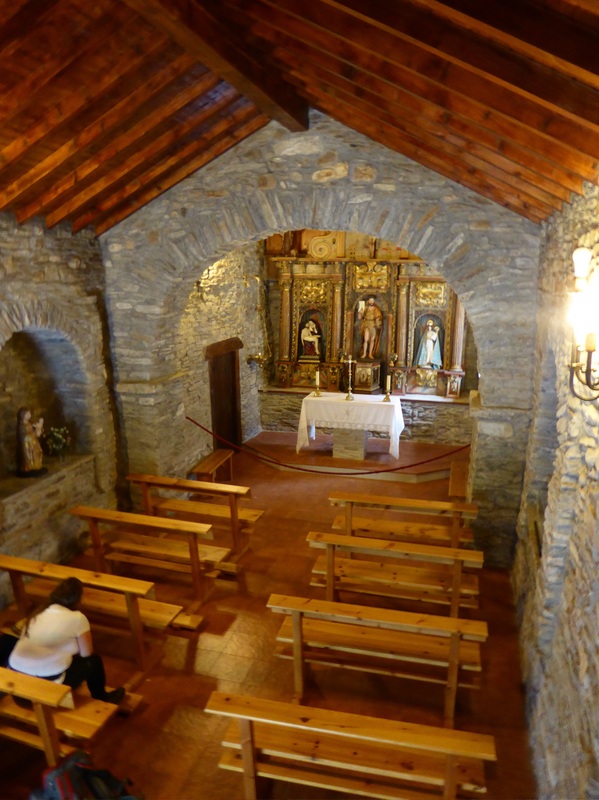 Galicia is another of Spain’s unique cultural areas which we will write more about on our next rest day. After a snack break we proceeded onto our destination of Sabugos. There were several small farm villages enroute with most of the old buildings in ruins. Every once in awhile amidst the shambles there is a jewel to be found. This day for us it was a tiny stone chapel with candles alight and the wrought iron gate open and welcoming. We ventured into a simple but beautiful sanctuary with polished chalices and candlesticks all entrusted to those who happened by. It was a heartening affirmation of a belief in goodness. Content we resumed our walk to our casa rural in the rain and cold. Meeting our hostess dressed for winter should have been a sign—-no heat was on and the room was freezing. Rod secured us a heater which helped a little. Fortunately, a nice Spanish couple arrived and addressed the issue and soon our radiators were bubbling away. Actually, our hardy host and hostess were extremely kindly and dinner was incredible, everything from the farm including the beef. It seems the cows come home very late in Galicia as we were lulled to sleep by a symphony of cow bells clanging and the resident dog barking. It is tough fighting the wind. 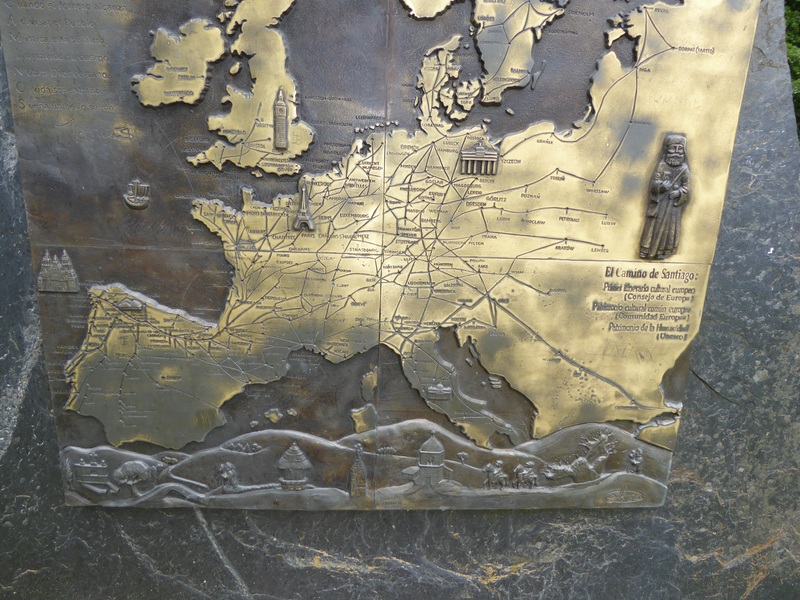 Need to stop and think sometimes – of earlier pilgrims without gortex, walking boots, maps and compass. 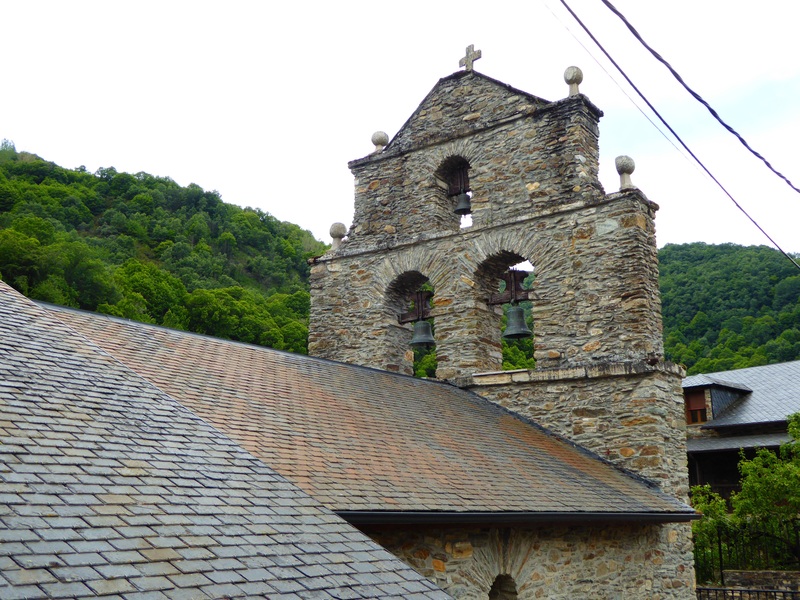 The church Delana mentions above, such a typical pilgrim’s church along the way. Made of slate they are so simple but picturesque. Inside that little nondescript chapel by the road are all the relics and treasures of the church – no guards, no cameras, no attendant. 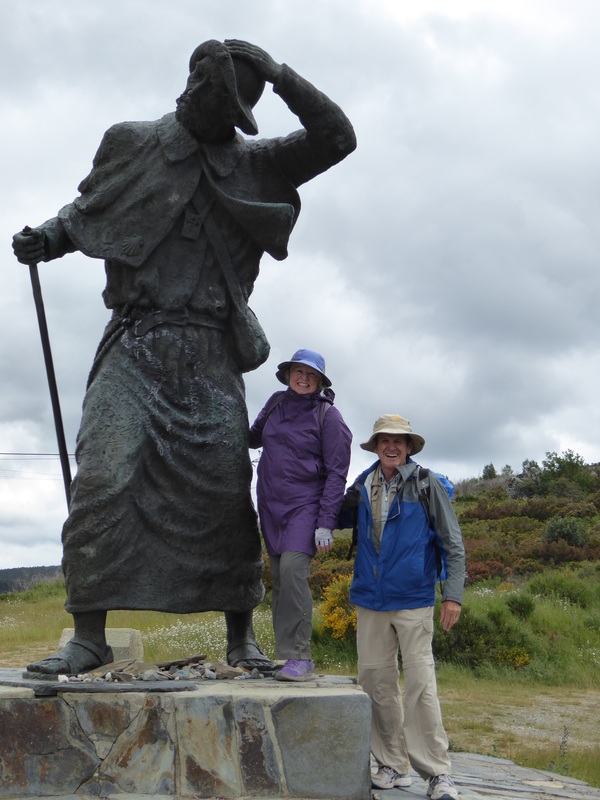 We like to think that they are protected by the spirit of the Camino. A palloza. 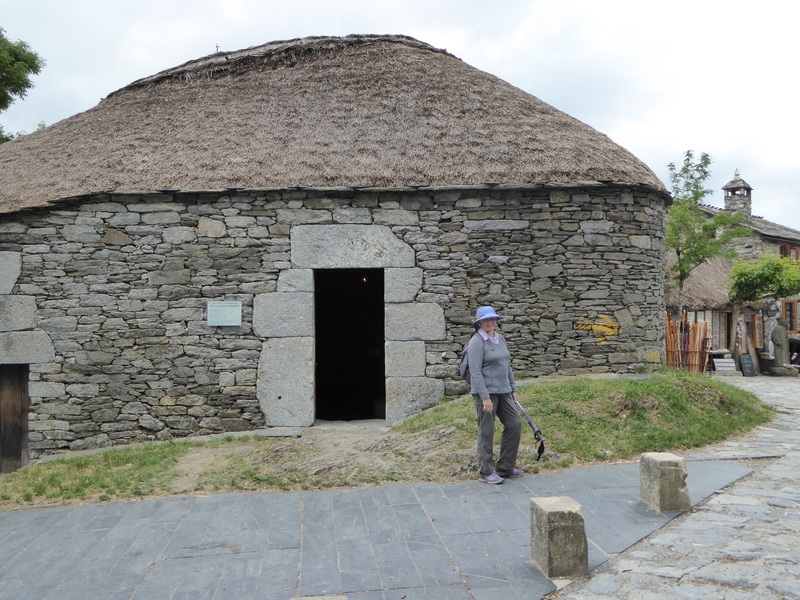 From Celtic times 1,500 years ago, right up until the 1960s, the townspeople of O Cebreiro shacked in these humble, round stone huts with peaked thatched roofs.